With the appearance of pretty good cameras in phones, tablets, and even glasses, which also may show all the pictures at any time, it is strange, but the very notion of “instant printing” has not sunk into oblivion. In the representation many people, snapshots are associated with the ancient massive Polaroid cameras and poor image quality. People think of those days with nostalgia and Polaroid photos are stored somewhere in the attic. But the current generation still has a warm memory of the magical reveal of your image on a black blank square Polaroid card. In this regard, manufacturers do not cease to issue new print cameras, experimenting with form factors and even playing with the customer’s taste. The market is already filled with a variety of models both too expensive and affordable. 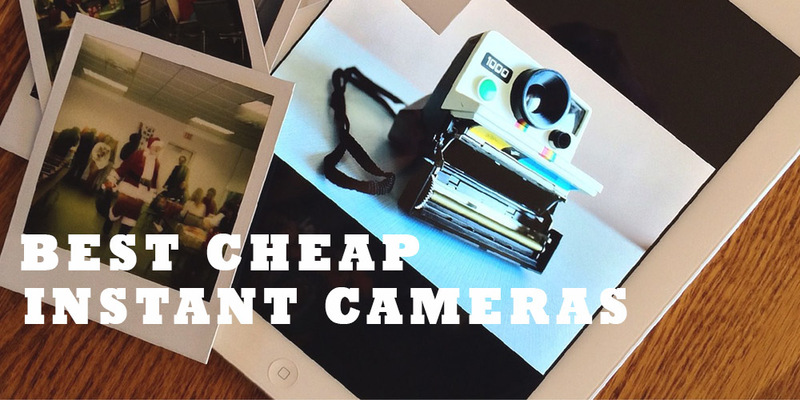 That’s why, in this article, we are going to discuss the best cheap instant cameras so that you could keep your memories not only in the cloud-based technologies but also in the ordinary album. 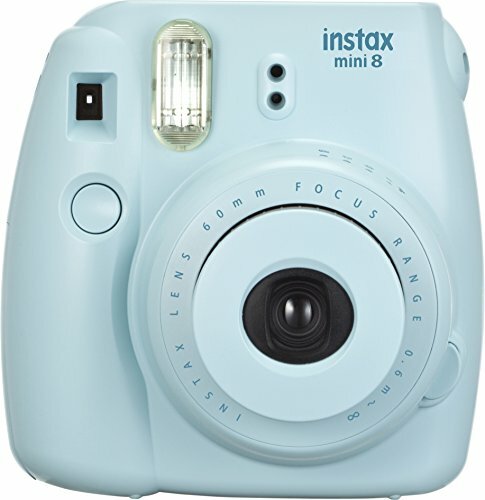 At first glance, Fujifilm Instax Mini 8 resembles a toy. For this small device with the dimensions of 118.3 x 116 x 68.2 mm, which weighs 307 grams, is easy to find a place in the bag. With Instax Mini 8 it’s nice and pleasant to travel. 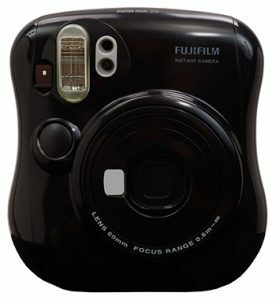 And looking at the most accessible among the entire series of Fujifilm instant cameras price of around $59, it’s a sin to deny the pleasure to become the owner of this bright camera, especially because a variety of colors is available. The camera body can be white, blue, pink, yellow, and so on. 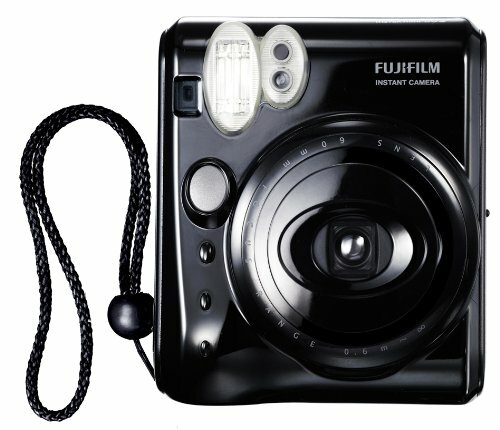 In contrast to previous models, where the four batteries are required, Fujifilm Instax Mini 8 is powered by two AA size batteries. Thanks to that, the developers managed to make the camera lighter and more compact. One pair of batteries lasts for 10 cartridges. Each cartridge is a film for 10 future pictures. Thus, with only two batteries you can make a hundred shots. One of the major advantages of Instax Mini 8 is the ease of use. The only thing that should be regulated is the Light mode, which the camera actually chooses by itself. As a result, you will get the photo with the size of 54 x 86 mm and the image size of 46 x 62 mm. The developers have provided several setting options for the best exposure, which are marked on a rotating lens ring. When you turn on the camera, the lamp lights next to one of the mode icons, and you only need to turn the ring to select the recommended mode. In addition, there is an interesting creative Hi-Key function, allowing you to take pictures with bright and soft colors. 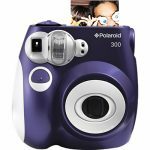 Overall, this camera will amuse a noisy crowd at the party, picnic, and also will be a wonderful gift for both children and adults. 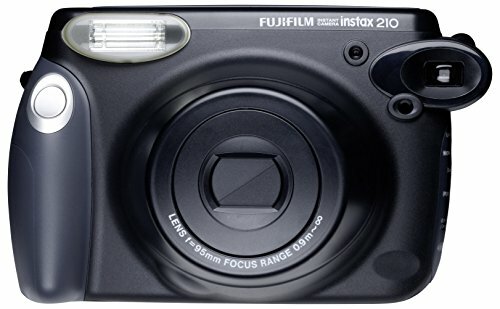 Fujifilm INSTAX 210 is an instant print camera, which makes photographs in the size of 86 x 108 mm, which is considerably greater than the photos of INSTAX Mini series or competitors’ products. The image size on the card is less, and it is 62 x 99 mm. Thus, the aspect ratio is close to a classical 3:2. The lens with a focal length of 95 mm, consisting of only two elements, provides photos in retro style, with soft focus. The camera has a minimum of manual settings. The user can make small changes to exposure metering (lighter, darker, mean value) and control the flash. By control, it means turning it on or set to Auto mode. The forced shutdown is impossible. Also, you can choose one of two focus positions: from 0.9 to 3 m and from 3 m to infinity. INSTAX 210 is powered by 4 AA batteries. The charge lasts about 10 sets of cartridges or the same 100 photos as in Instax Mini 8. Overall, INSTAX 210 is great for photos of parties and other gatherings of people. The camera is able to clearly capture the emotions in your precious moments. 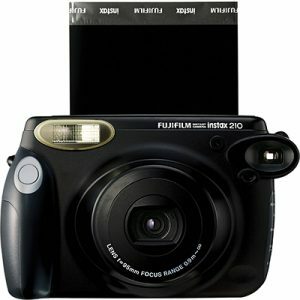 Fujifilm Instax Wide 300 is a descendant of the previous Fujifilm Instax 210 model. The new camera is more like a professional camera. It features a tripod socket, the focus ring, and improved grip – now the camera lies in the hand more comfortable, which makes the process of taking photos a bit easier. The device is powered by four AA batteries. Large image format allows you to take landscapes, architecture, and group photos. The built-in auto flash makes the picture sharper, so in any lighting conditions, you’ll get a great result. In addition, Fuji Instax Wide 300 has an exposure function: it’s possible to darken or lighten the image depending on the light conditions. The focal distance can be from 90 cm to 3 meters and from 3 meters. Fujifilm Instax Wide 300 uses the same film as the INSTAX 210 – cartridge Instax Wide. Consequently, the photo size is approximately two times bigger than a regular credit card. It equals to 86 x 108 mm with the image size of 62 x 99 mm. 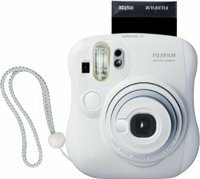 Fujifilm Instax Mini 50S is a simple camera with a handy feature to print instant images, the size of which is 62 x 46 millimeters. The smooth lines of the body and the compact size of this model will especially be appreciated by the beautiful half of humanity and not only. 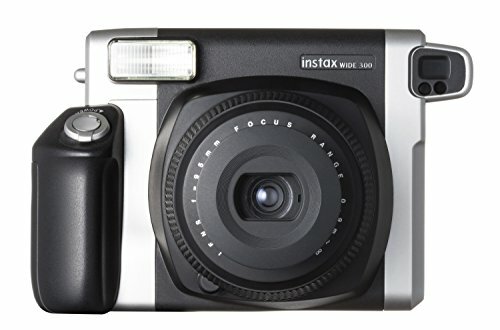 The owner of Instax Mini 50S does not need special skills because the settings and focus of frames are performed automatically, in just a second. The built-in flash adjusts the brightness and illumination of the obtained images when taking pictures in dark rooms or at night. Manual exposure metering amendments are possible within 2/3 step of exposure, allowing you to make the photo slightly lighter or darker, according to the photographer’s idea. 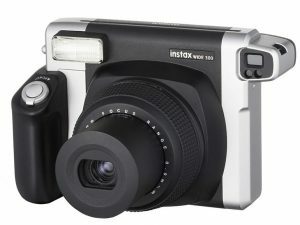 The distinctive feature of INSTAX Mini 50S model is the ability to set the timer and tripod socket, which is no so common for instant cameras with a price below $100. For the convenience of a self-portrait shooting, the shutter button is duplicated on the front panel. Just 2 AA batteries are needed for power supply. 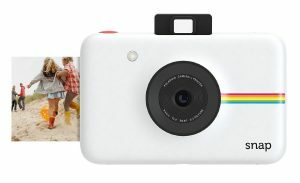 Fujifilm Instax Mini 25 is a camera for snapshots. Film and cartridge for printing photos are located inside of a stylish case, which weighs only 275 grams. Compact and stylish Fujifilm Instax Mini 25 is equipped with a built-in flash, the two shutter buttons (for normal shooting and self-portraits), as well as a convenient mirror above the lens. The combination of good Fujinon lens and Fujifilm Instax Mini cartridge allows getting the great and high-quality photos. Built-in flash works effectively at a distance of 0.5 to 2.5 meters and triggers automatically. For the forced shutdown, you need to change the focus to infinity. Unfortunately, in a close range, the flash can’t be turned off. The size of the resulting photographs will be equal to 86 x 54 mm, but the image itself will be 62 x 46 mm. 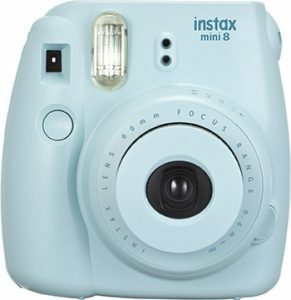 The camera Instax Mini 25 can be a wonderful gift. It is surprisingly easy to use and even a child can take pictures with it. 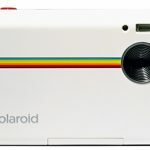 Of course, the main competitor of Fujifilm, the manufacturer of all the above-mentioned cameras, is the company Polaroid, which is associated with the instant photos first and foremost. The quality of cameras from this manufacturer also shouldn’t be doubted. Compact Polaroid PIC 300 camera with the focal length of 60 mm is designed for those who want to go back in the days of instant photography. All that is required from the photographer – choose the subject and press the shutter button. From the camera, you will immediately get the imprint with the size of 53 x 86 mm with the famous white frame. The modern design of PIC 300 is functional and practical, but it cannot be called strict: rounded lines, multicolored plastic and a minimum of controls. Besides, it has a nice price of about $70. The instant camera works from four AA batteries, and when taking photos in dark environments, it automatically uses the built-in flash. 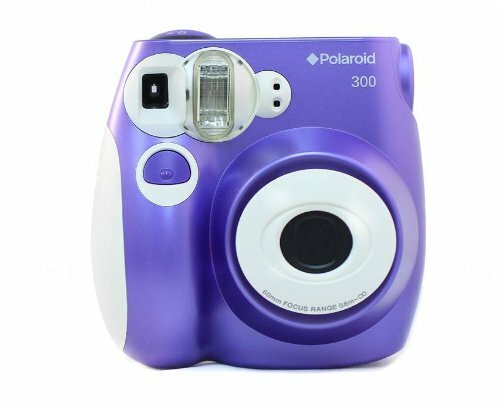 Polaroid Snap Instant Digital Camera is the instant printing of pictures without the use of cartridges and ink. The camera uses Zero Ink Printing Technology, which was developed by Zink company. It works very simply: the heat from the printer reacts with dye crystals embedded in the photo paper. Thus, we get images with the size of 86 x 54 mm. Their digital copies are stored on a microSD memory card up to 32 GB. 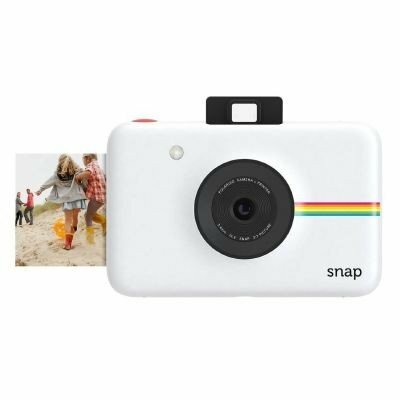 Polaroid Snap Instant Digital Camera is very compact. Its dimensions are 132 x 132 x 30 mm. This will be very handy for travel or vacation. The built-in software helps to process the received images. Color, sepia, and black-and-white image modes are available for users. In addition, a printed card can be provided with a white frame, typical for classic Polaroid cameras. It is the perfect combination for those who don’t want to wait until the image will be printed on paper but also do not mind to have a copy on their computer. Also, it can be interesting for those who like to surprise others: click-click-click – and now you can hold small, but bright and realistic photos in your hands. 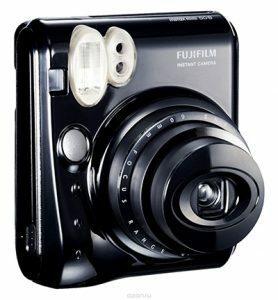 To sum up, the success of the cameras with the function of shooting and instant printing is difficult to underestimate. So choosing the cheapest instant camera, which will be ideal for you, it is worth considering one of our proposed options. And since both companies are characterized by the high quality of their products, and the properties of the cameras are quite similar, you should choose by heart.